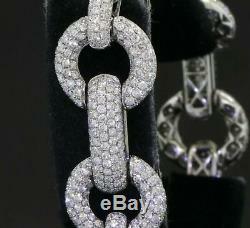 » BA designer heavy 18K white gold elegant 20.65CT diamond cluster link bracelet (SFLmaven). 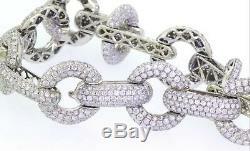 BA designer heavy 18K white gold elegant 20.65CT diamond cluster link bracelet. Fresh From a Fabulous South Florida Estate! This fashionable piece of jewelry is crafted in beautiful 18K white gold and features multiple diamonds (SI-1 to SI-2 clarity/G color), with a combined weight of approx. These Round cut stones are prong set in an elegantly designed link bracelet. 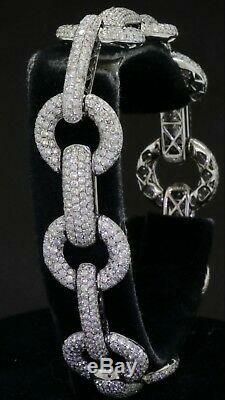 This bracelet has a crisp/secure fold over clasp and is sure to enthrall anyone who wears it. Perfect addition to any jewelry collection! If we have box, papers, documents, etc. For this item there will be photos below. If there are no photos of these, we do not have them. Measures: Height: 0.25 Inches (6.4 mm) Width: 0.62 Inches (15.7 mm). Wrist Size: 7.25 (wearable length). Total Weight: 21.3 Pennyweight (33.13 Grams). Diamond Weight: Total weight is approximately 20.65 carats. Above Average SI-1 to SI-2 clarity/Colorless G color diamonds. Please view all the photos below as part of the description. A careful eBayer who takes the time to study the photos, reads the entire description, and asks pertinent questions is our best customer. Flawless : FL : No inclusions or blemishes visible under 10x magnification. Internally Flawless : IF : No inclusions visible under 10x magnification, only small blemishes on the diamond surface. Very, Very Slightly Inclusions : VVS : Minute inclusions that are difficult for a skilled grader to see under 10x magnification. Very Slightly Inclusions : VS : Minor inclusions that are slightly difficult for a trained grader to see when viewed under 10x magnification. Slight Inclusions : SI : Noticeable inclusions that are easy to very easy for a trained grader to see when viewed under 10x magnification. Imperfect : I : Obvious inclusions that are clearly visible by the naked eye to a trained grader. All of our diamonds are real and none of our gold is plated (unless otherwise noted). We test all diamonds and gold before we list it. In addition all jewelry is cleaned with professional tools prior to listing. Sometimes reflection from the camera can create a dark area in our photos. These "dark spots" are not on the jewelry. We reserve the right to re-list items not paid for after 7 days. This includes alteration or damage to any and all box(es), documentation, paper(s) and/or certificate(s) that accompany item. Please do not ask us not to leave feedback. The item "BA designer heavy 18K white gold elegant 20.65CT diamond cluster link bracelet" is in sale since Friday, January 18, 2019. This item is in the category "Jewelry & Watches\Fine Jewelry\Fine Bracelets\Diamond". The seller is "sflmaven" and is located in Fort Lauderdale, Florida. This item can be shipped to United States, Canada, United Kingdom, Germany, Japan, Australia.